StumblePod.com | Technology, Design, How To, Gaming and Apps. "The trick I figured out is to pretend the bird is bouncing off of the bottom pipes. Whenever he's about to fall, I mouth "boing" as if he's bouncing and tap at the same time. Got 32 that way." 1) Don't tap the screen when the bird is around the upper pipe. 2) Tap the screen when the bird drives, so that it looks like its bouncing from the lower pipe. 3) Mouth or say the word "boing" for added bonus. Happy Gaming. 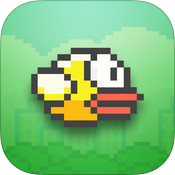 You can download Flappy bird for Android and iOS. Some of the best premium paid apps and games have gone free in the celebration of Apples App Store's Fifth Anniversary. The complete list is as follows. Don't forget to download both the iPhone and iPad version where available. Hurry, it's a limited time offer. Your favourite game now with lightsabers and princess to save. Download the iPhone version here and the iPad version here. Easily my favourite endless game where you have to complete challenges. Download the iPhone version here and the iPad version here. Get the cheats and strategy guide here. Peggle is my favourite Popcap game and in my opinion the most addictive. Download the iPhone version here and the iPad version here. This gem of an app is a horror shooter from EA. And entirely new story from the console version, the game is a must download. Download the iPhone version here and the iPad version here. Yet another EA game where you parkor through platforms. A bit old but still loads of fun. Download the iPhone version here and the iPad version here. Three in a row for EA. This draw to land the plane game will genuinely capture your focus with its simple yet brilliant controls. Download this class for iPhone here and iPad here. A fun puzzler from Disney where you have to dig router for the water to reach its path. Download the universal app here. A bit surprised to see this one here. This new inde game is an atmospheric platformer with amazing sound and graphics. Download the universal app here. This classic game lets you complete missions with a fun accelerometer control. Unfortunately the game is not iPhone 5 optimised. Download it here. This beautiful game was the reason many invested in an iPad. It has rightfully won many awards and regarded as one of the best game of its genre I highly recommend you try it, download it here. I personally don't like this game hence it is last on this list. It has good graphics but gameplay and strory are disappointing. If you like insipid slasher games get this here. This app is usually $19.99. The most expensive app on this list ! It's free and is genuinely good. Insta-download the iPad version here and iPhone version here. The iPad version is significantly better. Based from the popular book by the same name, this essential app is informative. Download it for you will eventually need it here. Those who like journaling will love this app. Its clean, easy and feature rich. There is a reason it was App of the year 2012. Download it here. As the name suggests the interactive 3D globe is immersive and informative, especially for children. Get it here. Its a fun photography app where you can add gorgeous text to photos. Its universal and works great. Download it here. Sony PSN, PS3, PS classic and PSP sales and discount are difficult to track, especially for a person like me who doesn't sign in to the playstation store that often. Blogs like kotaku, polygon, gamespot and ign and hard to keep up with since the have tons of post on a daily basis. Fortunately, there is a simple solution to this that is often overseen, the playstation blog. Yup, playstation has a blog and video shows on PSN that reviews games and inform sales and discounts. I found the blog to be extremely helpful since it lacks fluff like console and game rumors that plague most gaming sites.